Demonstrate and Celebrate Your Contributions to L&D Through TDRp. 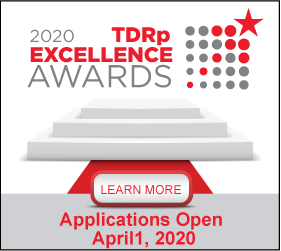 The Center for Talent Reporting is pleased to announce the first annual Talent Development Reporting principles (TDRp) Excellence Award. This unique award focuses on the forward thinking, transformational work of L&D teams to show impact and value through management, measurement, evaluation and reporting of L&D programs and the function overall. You may apply to a single award category or multiple awards. For each award category to which you apply, you will be asked to provide documentation showing examples of current practices in your organization. You will also be asked to answer several supporting questions. Each application will be considered for each category where information is provided. You do not need to provide information for all categories to be considered for a specific award. Applications are due by midnight EST on Friday, December 1, 2017. The Center for Talent Reporting will recognize finalists in each of the five categories and in overall excellence. Finalists will be notified by Monday, January 15, 2018 of their selection and the winners will be announced at the CTR Annual Conference on Wednesday, February 21, 2018.